Mango Salsa recipe by bestchefs at PakiRecipes.com. 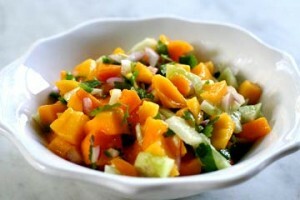 Mango salsa is the perfect summer time recipe that can be used as an appetizer. Mix every thing in a mixing bowl and let it stand for 5 to 10 minutes to all the juices mix well. Serve it with any type of sandwich or with daal chaval.